Two other Packs are available: the $69.99 GoNerd Pack (center chassis, hex driver, and 2GB flash drive), and the $59.99 GoPlay Pack (center chassis, LED light, and wine tool with corkscrew, foil knife, and bottle opener). A $26.99 hex driver/LED light combination component is also available. 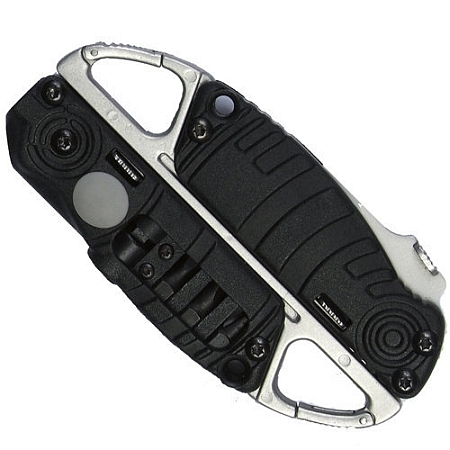 The dual-carabiner chassis is available by itself for $9.99. What do you think? Would you want a multi-tool like this that you can customize? As a Father’s Day Special, CRKT is offering free UPS ground shipping for all orders made from May 25th to June 14th. Big fan of CRKT products, but NOT on this one. If I need to go somewhere and need two (!) tools, I sure it would be more convenient two just take the two damn tools instead of locating the dedicated matching set and assembling them for this thing. Not. Have several CRKT knives, but I’m not paying that kind of money for those tools. I would lose my nerd status forever, thus alleviating the need for a GoNerd pack. BTW – that name is only 1 letter away from a testicle. You need a GoNad pack to buy one of these. Interesting idea, but can’t say it’s worth the NASA pricing. Agree they need a GoNad pack for these. I’ve never been a fan for using the carabiner as a tool platform. I have many sizes of carabiners that are load rated for human weight. Why companies need to put out products that mimic carabiners and could endanger the lives of people is beyond me. I do not require a carabiner on my knife, as many of my pants are equipped with pockets. I have to say “Not” for this one. It’s ok but definitely not hot. I *think* that the clips are there to enable you to clip tools like these to your key ring, reducing a tool to a breloque. This is a designers’ answer to a question that nobody asked. I got to see one of these the other day and can definitely say that I will NOT be purchasing one. Plainly put it’s just not a good design. It’s a shame since my previous CRKT knives have been nicely designed and well made. I have to say that I have a CRKT M16 (spearpoint in ER) clipped to my pocket right now and I love it. I also have many carabiners for climbing. I don’t really think that non load-bearing biners are dangerous as I think most people aren’t going to use them to clip in to, but that said this looks like a pretty poorly designed tool. The idea of a customizable multi-tool is hot, in my opinion, but this tool misses the mark for what I would want it for. I have often thought that it would be neat if you could order multi-tools with the ones that you want on it selected on the website and it would ship your customized tool to you, but maybe I am the only one that would bite at that. I have the Go play and Go Work flux kits. I can say in confidence that it needs some work, but it is useful. I personally like the carabiner option as it allows me to clip it to my molle gear in the military, and secure both ends of the knife in my molle with the dual carabine option. 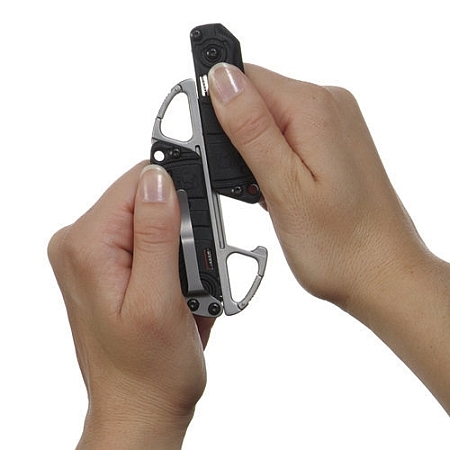 The knife is standard CRKT quality as for the other tools, but the Carabiner part is crap. The tiny clasp bar is made out of plastic while the rest of the chassis is made out of aluminum. I have broken the clasp off at least twice now and the tiny parts get lost. But at least a new one is only $10 bucks. I will say that if they made it without the carabiners on the ends and just offered the chassis with the tool, it would be extremely nice.